Did you know your water heater is most likely the least efficient appliance in your house? The United States is one of only a few countries that still heats water in a tank. The hot water tank you have in your basement heats water 24 hours a day, 365 days a year, regardless if you are sleeping, on vacation, or just out during the day. Clearly, keeping a tank full of water hot all the time is not very efficient. With today’s ever increasing cost of energy, and the constant rising price of standard water heaters, perhaps it is time for you to consider making the switch to a tankless water heater. Tankless water heaters only heat the water you need when you need it. Tired of running out of hot water or having to take cold showers? Tired of waiting for hot water to take a shower? An energy efficient tankless water heater provides you with an endless supply of hot water. The compact size of a tankless water heater will also instantly increase your storage space by doing away with the need for a bulky tank. 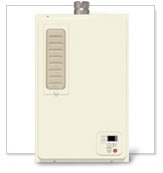 Commercial customers can also enjoy the benefits of energy saving tankless water heaters. Tankless units are a great energy saving solution in many types of commercial applications such as restaurants, apartment buildings, hotels and retail stores. D.W. Bahr Plumbing and Heating are authorized installers of all major brands of tankless water heaters including Rinnai, Rheem, Noritz, EcoSence and Paloma, just to name a few. Please Contact Us today for a price quote or any questions you may have. 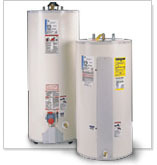 We offer a wide variety of tank and installation water heater packages. Many of our residential water heaters are customizable with 6, 9, or 12 year warranties. With over 150 water heaters in stock, almost all water heater orders are installed the same day. We install all major water heater brands including but not limited to G.E., Rheem, Ruud, State, A.O. Smith, Bradford White, Jett Glass, and American. We are also your local G.E., Rheem, Ruud, State, and A.O. Smith factory authorized warranty service representatives. We also service and install many types and brands of commercial water heaters. Please check our commercial page for more information. For price quotes and service please Contact Us today.